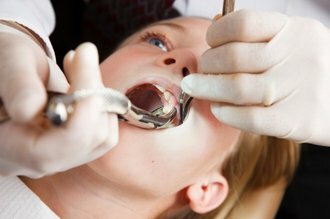 Broken, decayed, or abcessed teeth often need extracted. The tooth is loosened by gripping it tightly and wiggling it back and forth until it can be lifted out of the gums. Sometimes a tooth may be impacted so tightly that it cannot be simply lifted out of the gums. In cases like this the tooth will be cut into pieces first before being removed. When having a tooth extracted the tooth is numbed and the patient only feels pressure. Depending on the incision and extraction site, sutures may be needed to close the area. Soluble sutures are the best option, which will dissolve on their own. After the surgery you will need to rest. . You can expect for the extraction site to bleed for a little while after the surgery. Gauze will be applied at the completion of the surgery, and you will need to change it when it becomes soaked. If bleeding continues for longer than 24 hours you should call your dentist. Rest when you return home, but do not lie flat. This could prolong the bleeding. Prop your head up on a pillow when lying down. Your dentist will prescribe you pain medication, so if you become sore take as directed. You can also use an ice pack for the pain. When drinking, make sure you do not use a straw. The sucking motion can slow the clotting process. The same goes for smoking. If you have prolonged pain, bleeding, irritation, or don't feel that the extraction site is healing properly call your dentist for a follow up.